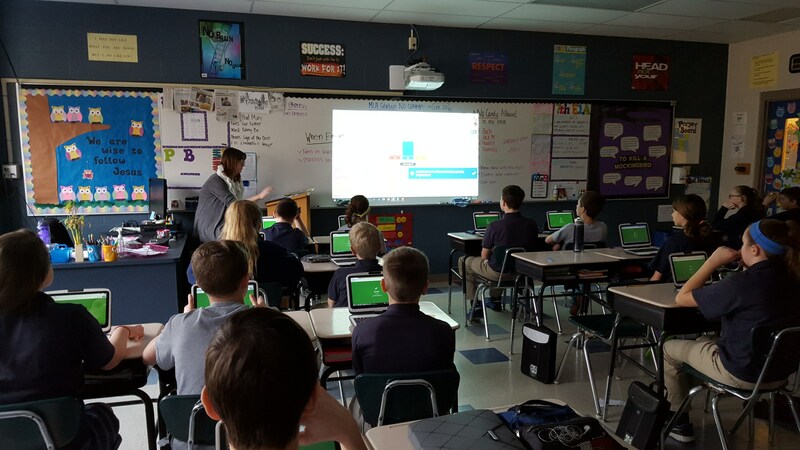 Each K-8th student attends a weekly computer class where they work on projects ranging from necessities of Internet safety, keyboarding and Excel skills to utilizing OneNote and OneDrive Cloud for digital organization for all their educational needs. Students and teachers have access to over 800 devices and can easily connect anywhere on campus with our 100% full density (802.11ac) coverage which connection speeds up to 1.3 Gbps. This level of connectivity is essential since every classroom is equipped with Smart Boards, interactive projectors, document cameras, and Apple TVs. 6th through 8th grade students participate in our 1:1 program. They are provided a personal tablet computer to use throughout their school day and to take home. This gives access to textbooks, teacher-generated lessons, use of real-time questioning, real-time insight of classroom levels of understanding and which is performed on their tablets. Students also use tablets to take and organize notes using OneNote. Teachers have the ability to deliver curriculum, create lessons, and collaborate with students. 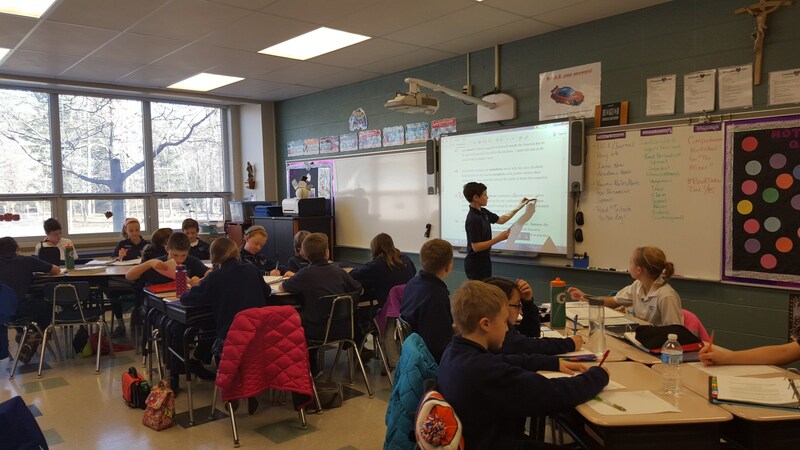 Implementation of Office 365 suite allows this all to be done from cloud which means all IHM students and teachers have access to all resources all of the time. Laptop carts equipped with classroom sets are utilized in grades 3, 4, and 5 allowing students to work on research and curriculum related projects with classroom teachers. Our students are given opportunities to search the Internet for information that is reliable and to use that information to illustrate their learning. Students have the ability to collaborate simultaneously with teachers in real time while working within their assignments. K-6th students have IPad carts available to use in learning stations. Teachers assign lessons and tests or use apps that teach while capturing student interests and enthusiasm. Technology is an important tool that better addresses the different leaning styles of our students. The primary goal is to give every student the opportunity to learn the technology to give them an advantage for moving to their next grade level into high school, and beyond. It is vital that we constantly strive to substitute, augment, modify, and redefine the way technology is used. 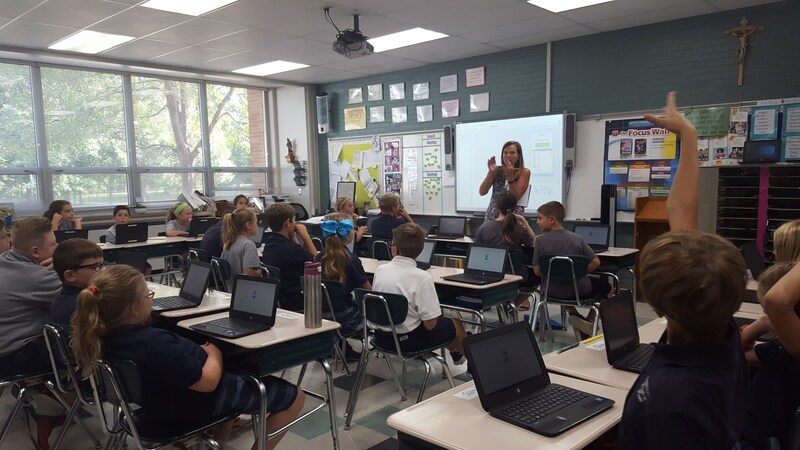 Immaculate Heart of Mary School continually assesses and evaluates the school's software, hardware and technology services to provide students and staff with the most useful and current technology. IHM has an in-house technology staff that provides software and hardware support, in addition to acting as an information resource. Complete overhaul of computer lab with top tier computer systems to accommodate our new Virtual Reality headsets. The wireless system was installed in summer of 2015 and specifically designed to support all 800+ devices and to give IHM campus 100% coverage. Every classroom is equipped with Smart Boards, interactive projectors and Apple TVs. Document cameras, handheld cameras, broadcast equipment are available for students in K-8. Across the whole campus, there are 240 IPads in use that provide our students a variety of platforms to enhance their learning.